As each setup can be different, I will take mine as a reference (the "Goto setup" ), and explain it as simply as possible. This tutorial is meant to be IDE independent, and as such, use "conventional" naming of things and doesn't describe IDE settings step. Those you should know how to do, since you are supposed to choose your IDE while learning to code. For example, a "Project" is a group of resources, eventually with dependencies, that can be run. Eclipse uses this term, while IntellijIdea uses "Module". Not to be confused with IntellijIdea "Project" (which can be a group of projects) nor Gradle "Project", which are things that can be "built" through Gradle. This setup is based on dependencies, so build files are simplified and easier to change. This basically specify that "Project1" and "Project2" folders depend on the Forge folder. For example you code a main core API in the Forge source, and dependent mods in the other folders. You can add more to the list. Specific subfolders can be added with line such as 'Project/subfolder'. You can make it a bit more intelligent with code for folder look-up, but this is outside of my post scope.
) This body applies parameters to all projects, including the Forge one. Use "subprojects" to work on all projects except the Forge one. The first body is made to set the mod source differently. With this, the "Project1" folder contains directly the source package, without "src/main/" intermediate folders, and making sure all superfluous files are excluded (here, a "bin" folder, and any file or folder whose name begin with "build"). Of course, this entire file is optional and highly dependent on your own setup. reference the folder as File, for easy copy-pasting in another mod folder. by command line in Forge folder. Or with the Gradle plugin in Eclipse, open the gradle view and launch the "build" task for the Forge imported Gradle project. Again, you have multiple mods in separate folders, but don't want to use the Forge folder, nor do you want to build all mods at the same time. Indeed, you don't need to. ForgeGradle and its dependencies should now be cached. You can now delete the Forge project folder. You can now import the mod project in your favourite IDE , with the build.gradle file. by command line in a project folder, to get the corresponding mod jar in its build/libs subfolder. People call this setup "Pahimar-Setup", because Pahimar (Youtube Channel) introduced some tutorials on how to setup eclipse to include each mod as a separate project. Now I'm looking for on how to teach IntelliJ to load my sub-modules as separate mods. And don't forget the automated forge updates. I think IntelliJ can import Gradle projects if you point it the build.gradle file. You might have to change the run configuration on your own though. just wondering, are the Project1 and Project 2 folders in the Forge folder, or the folder that the Forge folder is in? Thank you for that clarification. Is there any way to include the Project1 and Project2 outlined in the code block? is that code in the build.gradle in the forge folder, or is is it the build.gradle in the "Project1" folder? That is the whole content of the build.gradle file in Project1 folder. Could you please update the main post so it fits the 1.7 upgrade because a lot of stuff changed in 1.7 so there's a new gradle version? You're just using the Gradle API, no need to update. I have to admit that I could only get this to work once... there is something I am missing. A problem occurred evaluating root project 'EclipseTest'. This is under 1.7.2.... using all builds I could find. The error line is always on the "apply plugin: forge" in build.gradle of the main project. Maybe a complete "noob" step by step version? At the independent setup, you said that you need to setup your forge folder with either "gradlew setupDecompWorkspace" or "gradlew setupDevWorkspace". Do you also need to run "gradlew eclipse" to make it work, cause i did everything you said in the post, but if i import a existing project into workspace, it can't find my project. Make sure the 'allprojects" body is between the "buildscript" and the "processResources" bodies. once before next attemp. Old build attempts could screw things. You can have a try with the "Independent" setup. I'd recommend using Eclipse with Gradle plugin to import as a Gradle Project. It is less clumsy that IntelliJ, IMHO. Running the Forge gradlew things is only needed once, to cache the libraries. The "eclipse" task is not needed here, AFAIK, because you are not using the Forge folder to import into Eclipse. The "independent" setup only needs a valid build.gradle file inside your project (not forge, the mod one). at your project, then import it. Thanks, this really helps me understand gradle abit. I'm trying to set it up so that my separate mods are source folders, and to build them separately. To test I copied the example mod and source folder and changed the names over to "test" (instead of example). I used the 1.7.4 build.gradle code from the Independent Setup, and changed the srcDirs to 'src/test'. When I build and copy the jar to minecraft, under the mods menu I get both the original example mod and my copied test mod. How can I set it up so that it excludes any other source folders in eclipse and builds a specific mod? It would be easier than moving the mods source folder out of the full directory itself, build, then replace the source folder again. Would be very tedious with more than one mod. You didn't follow my instructions for the "Independent setup" here. The problem you might not see, is that Gradle sets by default a test folder as src/test/java and src/test/resources, but this is for testing purposes and not supposed to be built with the 'main' sources. This probably conflicts with what you set into the build.gradle file. If you don't want to move out of the Forge folder, at least make a build.gradle file per mod. That is the easiest way to go. This looks complicated at a first glance. So now we have to learn Groovy if we want to understand what gradle does and how to configure it? And where I can see what all those tasks do exactly (source)? I don't think the "Independent" setup requires any groovy knowledge. That is the default setup that forge invites you to use. Obviously, the further you go from the default, the more you'll need to understand and change. I only needed to refer to the gradle docs to make this tutorial. 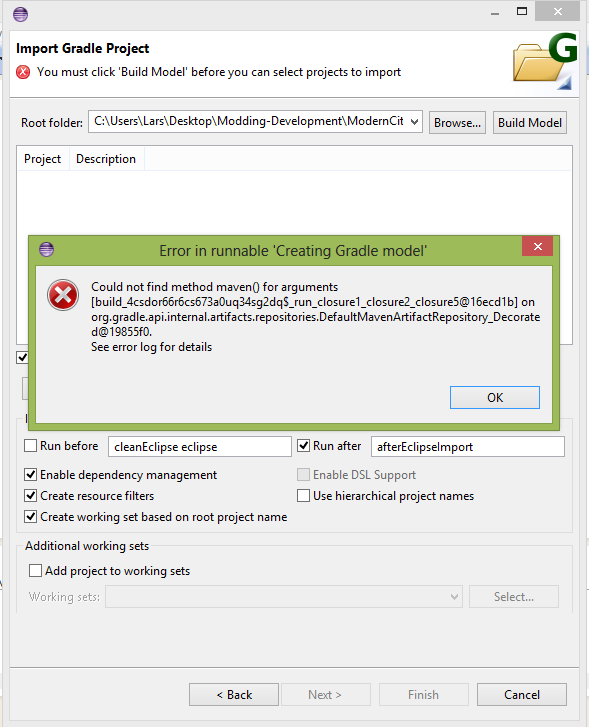 Eclipse tells you to "Build Model" before. I'd advise you to tick the "Run before" box, and add "setupDevWorkspace" to the command, between "cleanEclipse" and "eclipse". I ticked the "Run before" box, and changed that line next to it to "cleanEclipse setupDevWorkspace eclipse", but i got the same error. I searched over the internet, but i couldn't find a solution. Can you help me with this or are you out of ideas too? 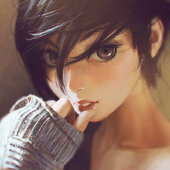 A problem occurred evaluating project ':Project1'. Having built a chunk of related but separate mods, I was keeping all the files in the same /src/main directory mostly because of not knowing what else to do, but given that I'd like to build them as separate jar files, I ended up here. Good news: I got it to compile. Umm...what didn't I do correctly? Unrelated, I should update Forge at some point, heh.